These beds are fully adjustable. The bed takes you from lying on the bed, to a fully seated position. 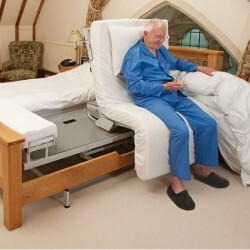 The lift and rotation makes getting in and out of bed a breeze giving you full support along the way. Victoria Linen offer a full range of bedding and mattress protectors to fit each part of the rotoflex bed. The sheets also come with an attached pillow case and attached tie backs to keep the sheet in place when the bed is raised. Choose from easy care poly cotton fabrics to 100% cottons in thread counts up to 1000 threads per inch. Fitted Sheet for Rotoflex 235 - 100% Cotton IvoryBeautifully soft fitted sheet set/ Made to fi..